Use any or even a mixture of Hemp Seeds, Chia Seeds, and Flax Seeds in place of cracker crumbs for things like hamburgers, meatloaf, etc. -Not only are they gluten free but they are an excellent fiber and protein source as well! -Use your own judgment but about 2-3 Tablespoons per pound of raw hamburger is probably a good starting point. I use an egg and several spices as well as kick it up with a bit of mustard, lemon or lime juice, fresh ground black pepper, etc., but that is up to you! -It also adds helps thicken and adds nutrients to makes you feel full faster and longer when you sprinkle about 2 Tablespoons into any salad, soup, stew, etc. -Mix about 1 teaspoon of spices into fresh coffee grounds before brewing for a “warm Christmas morning type feeling”. I make a mix using equal parts of ground cinnamon, ground ginger, ground cloves and ground nutmeg. -All these spices are very good for you in numerous ways and it is a great way to get them all into your diet without effort! -Use your own favorite spices or make a blend of your own favorite “comfort food” smells. Speaking of coffee -- do you LOVE a good cup of bold flavored coffee (or like me you love a good POT of bold flavored coffee) but hate the amount of caffeine that comes with it? One of my personal favorites and only takes about 5 minutes to make! -Boil 2 teabags (your choice of tea), 1-teaspoon baking soda and about 2 cups of water in a small pot for about 3 minutes. Let sit another 3 minutes. -In a 2L (or bigger) pitcher mix 3 cups cold water, 1 cup lemon juice (or any 100% pure juice such as lime/orange/pineapple/cranberry/etc.) and 1 cup sugar (adjust to your taste preference). -Add in tea from pot and stir well. -Add 8-12 ice cubes and store in fridge for up to 5 days. -Serve over ice or mix 1/2 and 1/2 with Sprite/7UP for a refreshing carbonated drink that tastes like summer in all seasons! Boil 1 cup of water in a cup in the microwave on high for 1 minute 30 seconds. (or use a kettle/pan to heat water and then pour hot water directly into large (heat resistant) glass/container; and continue with directions). -Add 2 Tablespoons instant coffee, sugar and cream/milk/coffee mate powder/etc., as preferred and stir well (you can use previously brewed coffee if you have it made). -Pour into a large glass over ice and add 1 cup more cold water/milk for a larger serving. -Serve over ice with cinnamon, chocolate, etc. powder/shavings or whipped cream for a special treat. -Throw it all in a blender with additional ice if needed, and make your own "frappe" instead! - Make it Irish by adding 1 ounce liqueur of choice to a single size or 3-4 ounces for a 1 Litre size if desired! -To make a large batch: use 2 cups hot water, 4 Tablespoons coffee, cream and sugar as desired, stir well and pour into a 1 Liter container adding 2 more cups cold milk/water. Fill jug with ice, stir well and serve. Swap ingredients listed for your favorites and personalize this into your own creation also. -This can be made in larger and stronger batches ahead of time and stored in the fridge like any other beverage. Make as directed but don't add ice. 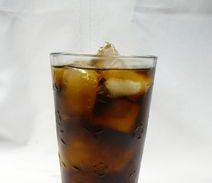 Pour what you want for a serving over ice in a glass or blend it up each time. This way you will have the "base" on hand whenever you want a special beverage or if company drops by it is a fast alternative to coffee or tea! I thought the problem was specific to a few places in Canada and the US, but since traveling I found that in many parts of the world tap water has so much calcium in it (either naturally or added) that it leaves a white filmy residue on pots and pans after boiling water that is extremely hard to get off. It is so bad in some cities I have lived in that I have actually thrown out pots as I couldn’t get that film off and was concerned it would transfer to food cooked in the pots. -Pour about 1 cup (for a small to medium pot, 2 cups for a large pot) of plain vinegar and fill the rest of the way with COLD water. -Let sit for anywhere from 10-30 minutes depending on how thick the white residue has caked on and then wash out while wiping with a dishcloth at the same time in warm water for a few minutes. -The residue should lift off the inside of the pot by itself while soaking but using a dish cloth to make sure it all comes off is a smart move. It is better to use a soft cloth than a plastic or metal scrubber though as scrubbers can smear the loose sediment back into the pores of the metal pot and/or scrape non-stick surfaces. -Wash the pot again normally with antibacterial soap and hot water and dry as usual. I hope this helps you and/or yours to find even more ways to live/eat/feel better and healthier in some way! Please send a comment via my website contact page form and let me know how this info has helped you and any tips you have that you would like to pass on as well! Have an awesome day, make YOUR life what YOU WANT IT TO BE and NEVER GIVE UP! Please LIKE/SHARE/FOLLOW/POST/+1/TWEET a link to this Update so that everyone can live/eat/feel better...faster, easier, cheaper!